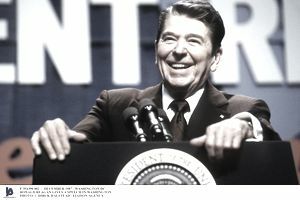 Ronald Wilson Reagan was the 40th U.S. president, serving from January 20, 1981, to January 20, 1989. His first task was to combat the worst recession since the Great Depression. In 1981, Congress cut the top tax rate from 70 percent to 50 percent. It helped spur growth in gross domestic product for the next several years. The economy grew 4.6 percent in 1983, 7.3 percent in 1984, and 4.2 percent in 1985. Reagan was applauded for continuing to eliminate the Nixon-era price controls. They constrained the free-market equilibrium that would have prevented inflation. Reagan removed controls on oil and gas, cable television, and long-distance phone service. He further deregulated interstate bus service and ocean shipping. He was successful in ending the Cold War. That’s when he uttered his famous quote, "Mr. Gorbachev, tear down this wall." To accomplish these goals, Reagan wound up increasing the defense budget by 35 percent. Ronald Reagan was born on February 6, 1911. He studied economics and sociology at Eureka College in Illinois. He became a radio sports announcer, then an actor in 53 films. As president of the Screen Actors Guild, he became involved in rooting out Communism in the film industry. That led him to develop more conservative political views. He became a TV host and spokesman for conservatism. He was Governor of California from 1966 to1974.